The Type 5 Chi-Ri (五式中戦車,Go-shiki chusensha) was the penultimate medium tank developed by the Imperial Japanese Army in World War II. Intended to be a heavier, more powerful version of Japan's sophisticatedType 4 Chi-To, in performance it was designed to surpass the M-4 Sherman tanks fielded by the Allied forces. The Type 5 Chi-Ri featured a lengthened version of the Type 4 Chi-To chassis, with eight road wheels per side instead of the Chi-To's seven. It had the usual Japanese track arrangement with forward mounted drive sprockets and rear mounted idlers. The Type 5 Chi-Ri had sloped welded amour, with a maximum thickness of 75 mm at the front. Originally, the prototype tank was to be fitted with the same Type 5 75 mm tank gun ( based on the Type 4 75 mm AA Gun) used on the Type 4 Chi-To. This theory is denied now though it was said "production versions were to be equipped with a Type 99 88 mm AA Gun ". A secondary hull-mounted Type 1 37mm tank gun was also planned, in the position normally taken by a machine gun, and two more Type 97 light machine guns to the front and rear would have added extra firepower in close combat situations. As with the Type 4 Chi-To tanks, the Type 5 Chi-Ri were earmarked for the final defenses of the Japanese home islands against the expected Allied invasions. Army planners envisioned large armored divisions equipped with the Type 5 Chi-Ri driving the invaders back into the sea, but the war came to an end before even the first prototype could be completed. The prototype was seized by American forces during the occupation of Japan, but its subsequent fate is unknown. One theory is that it sank in the ocean when a freighter taking it to the Aberdeen Proving Grounds capsized in a typhoon; another theory is that it was scrapped for its metal armor during the Korean War. Fine Molds has earned quite a reputation for accuracy when it comes to their various kits and this one seems to be no exception. 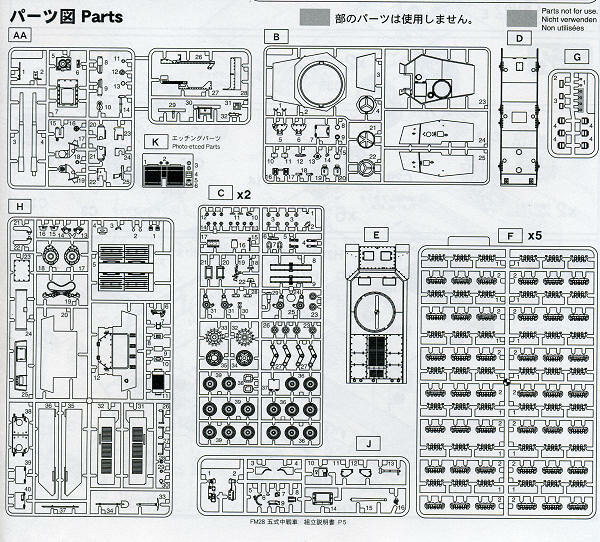 With no physical tank available to measure, they have relied on extant design drawings to get information on this kit. 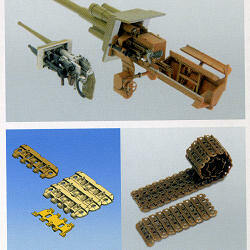 Molded in a brownish tan plastic, the kit's individual track links are molded in black. Detailing is superb with no visible glitches like flash, sink areas or unwanted ejector pin marks. There are a few towers that will need to be removed from a few of the large pieces, however. The tank has a one-piece lower hull and while it doesn't have a full interior, there are partitions. The instructions are quite helpful in showing the correct order for installing these interior parts. Despite its price, it doesn't come with a metal barrel, however, this and some other optional parts are shown in the off chance you have purchased them for use with this tank. The turret is not a single casting but made up of an upper portion, sides and back. A fully detailed gun fits within it. The commander's cupola can have the hatch open or closed. If open, there is little to see aside from the gun breech and the floor. The individual track links are also well molded and it appears that construction of these will be straight forward. Instructions show the proper direction for these so you won't end up installing them backwards. I've included a shot from the box side showing these tracks in a photo and drawings. It also shows gun details. The instruction booklet is well done with a full history of the tank with a photo and drawings included. Of course, it is in Japanese so of little real use to those of us who don't speak the language. The 27 construction steps are well drawn and provide painting information for the various bits and pieces. As there is only the one vehicle, the various markings options save one are all hypothetical and consist of little more than a Japanese character of some sort on either side of the turret. The tank can be painted in the variegated camo scheme as shown on the box art or in overall Olive Drab or 'Parched Grass' shade. We have seen a number of late war German project vehicles as of late and here is one for the Japanese. It should make for a most interesting addition to any armor display. Thanks to www.dragonmodelsusa.com for the preview kit. Get yours today from you local store or on-line retailer.